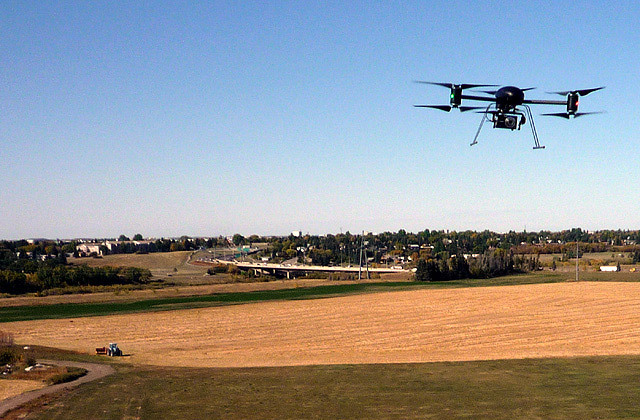 DraganFly Innovations of Saskatoon, Saskatchewan, Canada, has created a new unmanned aerial vehicle (UAV) designed specifically for remote controlled digital photography and digital video streams. 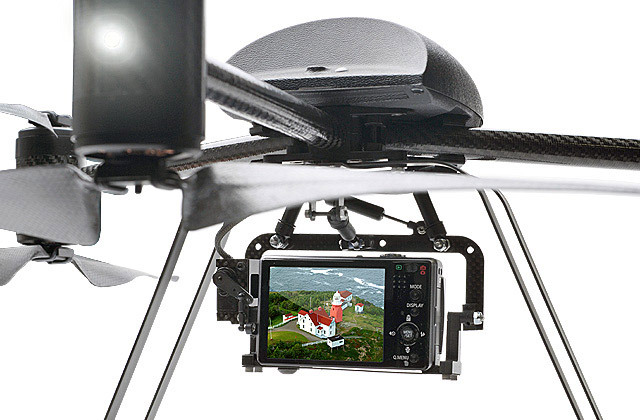 The helicopter is designed to self-stabilize during flight, making it much easier to control than other remote controlled helicopters and supports four interchangeable cameras including a 10.1 megapixel still camera, a 1080p high definition video camera, a low light video camera, and a thermal imaging video camera. The DraganFlyer X6 helicopter is approximately 36 inches long, 33 inches wide, and 10 inches high when deployed. It weighs 36 ounces and supports up to a 12 ounce camera payload. It can fly for up to 25 minutes at altitudes up to 8,000 feet high. It uses three pairs of rotors made of carbon fibers and the motor connects directly to the rotors, removing the high maintenance gears used by most helicopters. The helicopter includes two wireless links to the ground – a bi-directional channel for the controller and a helicopter-to-ground channel sending the captured photographs and video in NTSC and PAL-compatible formats. There’s also a MicroSD card that acts as a black box recorder capturing data from the onboard sensors including the orientation, altitude, direction, and speed of the helicopter. 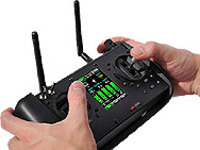 The handheld controller features a large OLED display and permits control of both the helicopter itself and its onboard camera (including camera angle, zoom, and shutter control). Video glasses help the operator see exactly what the helicopter sees at any given time, allowing for more precise controls and adjustment as well as the ability to zoom in on details in real time. A second MicroSD black box recorder is kept on the controller in case the helicopter is lost. One of the most interesting features of the DraganFlyer X6 helicopter is its ability to fold for transport and storage. The arms collapse inward like a tripod in closed position, resulting in a vehicle that’s only 27 inches long, 12 inches wide, and 10 inches high. Given its light weight of just over two pounds, the folded helicopter can be easily carried by nearly anyone. The DraganFlyer X6 UAV has many potential applications in both the commercial and military sectors. In addition to surveillance and reconnaissance, the helicopter can be used to capture news footage, for nature photography in rough terrain, for aerial shots of golf courses and buildings for promotional films, for inspections of property or of new construction, and for environmental assessment tasks. Boeing’s Hummingbird helicopter UAV, and the WaterScout helicopter that can be launched from a submarine at sea. More information about the DraganFlyer X6 helicopter is available on the product page on the DraganFly website found here. Videos of the helicopter in operation, being unfolded from its compact transport mode, and footage taken by the helicopter can be found here.